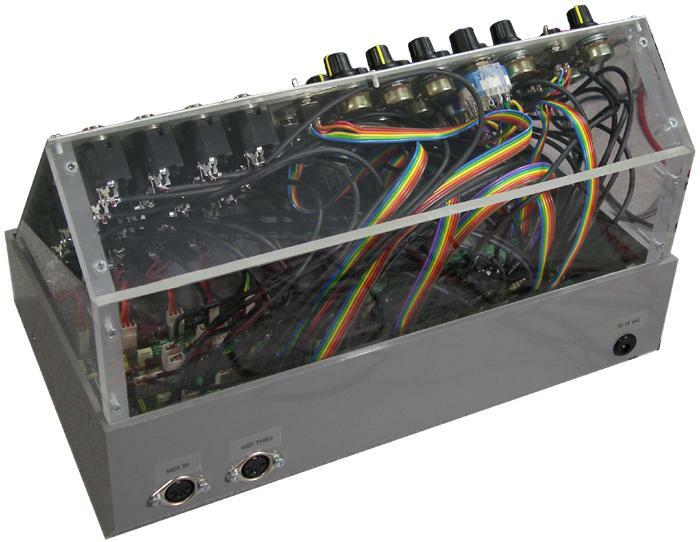 This is a modular compressor / limiter / distortion / gate unit. It was born out of my desire to have many different flavours of distortion available in a compact format. I'd had enough of my studio space being taken up by old mixing desks, battery powered guitar pedals, etc. just because I liked the sound of overdriving them. So I set about breadboarding many different designs until I found a set that gave me a good cross section of wonderful sounding distortions. 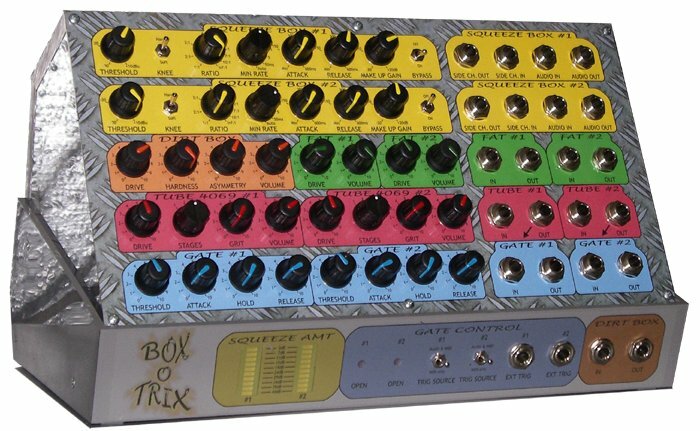 The next thing I wanted to add was a compressor or two - very useful to put before distortion in the effects chain, but I also wanted a super-flexible high fidelity unit to use stand alone as well. One nice feature is that the minimum attack rate goes so low that it makes it possible to introduce lots of self-AM distortion for bass sounds (can be a great effect, similar to a ring modulator). If the release rate is set above minimum then you don't get this effect, but instead you have an ultra fast peak limiter. And finally, after hearing the amount of noise that comes out of a 3 stage 4069 overdrive, I thought it a good idea to add a couple of noise gates. Then I decided to have them able to be keyed from external sources (either audio or MIDI) so they could be used as a 'chopper' effect. The compressor and gate units will work with anything from line level up to much hotter (there's plenty of headroom). The gain of the compressors is set by the Make Up Gain controls. The gain of the gates is 1. The distortion units will also work with anything from line level up to much hotter - just set the Drive controls appropriately. The output levels are quite hot (~10V ptp), but can be attenuated with the Volume controls.